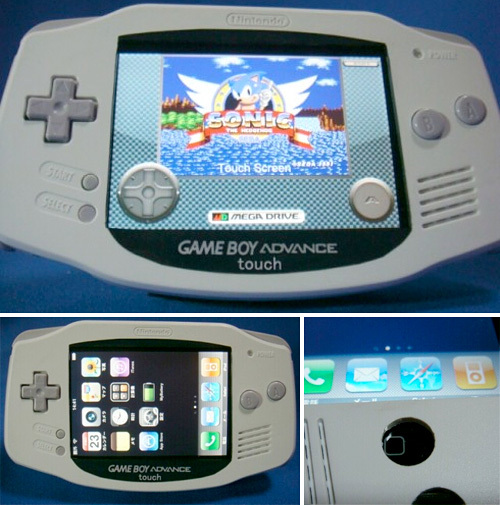 Game Boy Advance Turned Into An iPhone Case | OhGizmo! Nintendo fans might want to skip this mod because it requires sacrificing a Game Boy Advance, but since you couldn’t really see the LCD display on the original non-backlit model anyways, this seems like a far better use for the housing. The mod doesn’t require much in the way of electronics capabilities, short of removing screws and various bits of circuitry, but ‘Goteking‘ who created this bit of hackery did manage to stash the iPhone’s sync cable in the GBA’s battery compartment for easy access. And thanks to some clever alignment the ‘B’ button on the GBA can actually be used to press the iPhone’s ‘Home’ button. These days it is a very normal thing to know about such kind of invention and developments…..Whenever I read read this kind of motivating post I honestly feel guided and empowered by the spirit of enthusiasm. The game boy advance isn't very expensive now, so it's not really a bad thing to do. You could buy one for less than $30.